The Mastiff (also known as the ‘English Mastiff’) is a British breed which descended from the Alaunt and other Molossers several thousand years ago. ‘Mastiff’ likely derives from the Anglo-Saxon word ‘masty’, meaning ‘powerful’. The Mastiff’s ancient origins are with the Molossians, an early Hellenic tribe known for its powerful guard dogs. In Roman times, the Mastiff was employed as a war dog and fighter, pit in the Arena against gladiators, bears, and even elephants. By the Middle Ages, the Mastiff was a popular guard dog and hunter. Unfortunately, it was still forced to fight, matched up against bears, bulls, and lions in popular gambling dens. Many Mastiffs today descend from the Lyme Hall Mastiffs, a line beginning with Sir Peers Legh’s Mastiff, who protected him after he was wounded at the battle of Agincourt in 1415 (a stained glass window in Lyme Hall depicts Sir Legh and his Mastiff to this day). The Mastiff may have arrived in America on the Mayflower; it had certainly arrived by the 1800’s. Mastiffs decreased in popularity in England after bull-baiting, bear-baiting, and lion-baiting were outlawed, but grew in popularity in the U.S throughout the twentieth century, remaining a popular pet and guardian today. The charming character of the Mastiff has helped it find its way into popular culture. 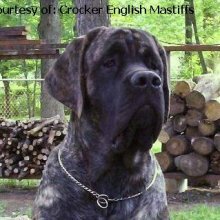 Famous fictional Mastiffs include ‘Hercules’ from ‘The Sandlot’ and ‘Kazak’ from Kurt Vonnegut's ‘The Sirens of Titan’. The Mastiff has a shoulder height of 70-76 cm (27-30 in) and weighs 68-91 kg (150-200 lbs). It is the largest breed by weight. In 1989, a English Mastiff named ‘Zorba’ set the Guinness World Record for heaviest dog at 143 kg (315 lbs), measuring over 8 feet from the tip of the nose to the tip of the tail. Mastiffs have a very large head with a short, wide muzzle, and ‘V’-shaped ears. They have a flat back, high-set, low hanging tail, and large, round feet. The Mastiff has a short-haired, fawn (light-yellow brown) coat, which ranges in color from silver to apricot to dark brindle. All Mastiffs have a black mask, ears, and nose. The Mastiff is confident, dignified, and very gentle-natured. Mastiffs rarely bark, but they are not fond of strangers and will defend their territory and family when necessary, making excellent guard dogs. The Mastiff tends to drool. The Mastiff is confident, dignified, and very gentle-natured. Mastiffs rarely bark, but they are not fond of strangers and will defend their territory and family when necessary, making excellent guard dogs. The Mastiff tends to drool. The Mastiff is good with children, and gets along well with other dogs and household pets if properly socialized. In the words of the 1800 Cynographia Britannica ‘What the lion is to the cat, the Mastiff is to the dog. The noblest of the family, he stands alone, all others sinking before him...I have seen him down with his paw the Terrier or cur that has bit him, without offering further injury. In a family he will permit the children to play with him and will suffer all their little pranks without offence.’ You can find Mastiff puppies priced from $300 USD to $2800 USD with one of our credible breeders. Browse through our breeder's listings and find your perfect puppy at the perfect price. The Mastiff coat requires little attention; dead and loose hairs should be removed with a rubber brush when the Mastiff is shedding. As with all very large dogs, the Mastiff needs a soft place to lie down to avoid pressure marks. The Mastiff has a lifespan of 9-11 years. Common health problems for Mastiffs include hip and elbow dysplasia (malformed joints which can cause lameness or arthritis) and bloat, which can be prevented by placing the dog’s food dish on a raised surface, spacing meals throughout the day, and avoiding exercise immediately after meals. Obesity is also a potential issue for Mastiffs; proper exercise and nutrition are critical. Mastiffs prefer life indoors and are not well suited to hot weather. In spite of its large size, the adult Mastiff has only an average need for exercise. It enjoys walks or play in a large fenced-in yard. Puppy Mastiffs should not be over exercised—the Mastiff requires all of its energy to grow strong bones and put on weight. Due to their large size and space requirements, Mastiffs are not recommended for small apartments. Mastiff Puppies for Sale - Shipped Worldwide! Finding the right Mastiff puppy can be dog gone hard work. PuppyFind® provides a convenient and efficient means of selecting and purchasing the perfect Mastiff puppy (or Mastiff puppies) from the comfort of your home, 24 hours a day, 7 days a week. Take advantage of our PuppySearch or leisurely browse our directory of hundreds of dog breeds, Mastiff dog breeders, Mastiff dogs for adoption, and Mastiff puppy for sale listings with photos and detailed descriptions. Some Mastiff puppies for sale may be shipped Worldwide and include crate and veterinarian checkup. Many Mastiff dog breeders with puppies for sale also offer a health guarantee. With thousands of Mastiff puppies for sale and hundreds of Mastiff dog breeders, you're sure to find the perfect Mastiff puppy.